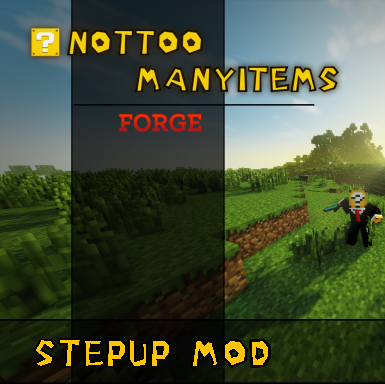 I'm using MC 1.11.2 with StepUp-v.3.0-mc1.11.2. Would you be so nice and implement a 0,6 block stepup for this version too, please? Are you asking me to allow you to step up 6 blocks? Try the latest StepUp with DynamicSurroundings-1.11.2-3.2.1.1.jar. Let me know if you still get the same error or not. Just wondering what makes this different from the vanilla auto jump? This mod doesn't take hunger to jump up a block, and is a smoother animation (my opinion). Cool, I might just go and test it myself now. After all, downloading files from a HTTP website isn't exactly secure. Don't take this in the wrong way though, I love your work! I really love this mod, it works so much smoother and more naturally then the auto jump in vanilla 1.10.2 which I run, and really makes exploration a lot less tedious, especially on hills. Curious about the incompatibility with Blood Magic and why that is? Even if it not fixable, I'm new to minecraft modding and learning still so curious about what the nature of the compatibility is. BloodMagic has an item that does the same thing StepUp does and it interferes with StepUp's ability to change a specific variable's value. This is actually an issue on your end. I de-compiled your mod and see that you're using player.field_70138_W = (activated ? 1.0F : 0.5F);. The default step height in 1.8 and above is 0.6F. In the newest version StepUp 3.0 for Minecraft 1.10+ , I've made the change from 0.5f to 0.6f and it works fine with blood magic now. Thanks for the info on the stepHeight change. Also the mod crashes a server if it's present in the server mods. Please make it so the mod can stay in the server mods folder. The mod isn't meant to be in a server mods folder. It's a client-sided mod only. I understand that, but I have symlinked the mods folder to my client and to my servers, which screws things up if I try to launch a server with your mod in it. Could you please add a check that doesn't crash the server? The 1.10.2 download is a .zip file. Could you please make it into a .jar file download instead? It's saving 4kb and the standard on curseforge is a .jar file, it took me a while to figure it out. This mod is really useful because the 1.10 auto jump doesn't work that great. Unless they fix the vanilla auto jump this is a must download.